Ever wonder how tomorrow’s bathrooms would look like? Will they be radically different from the ones we have today? 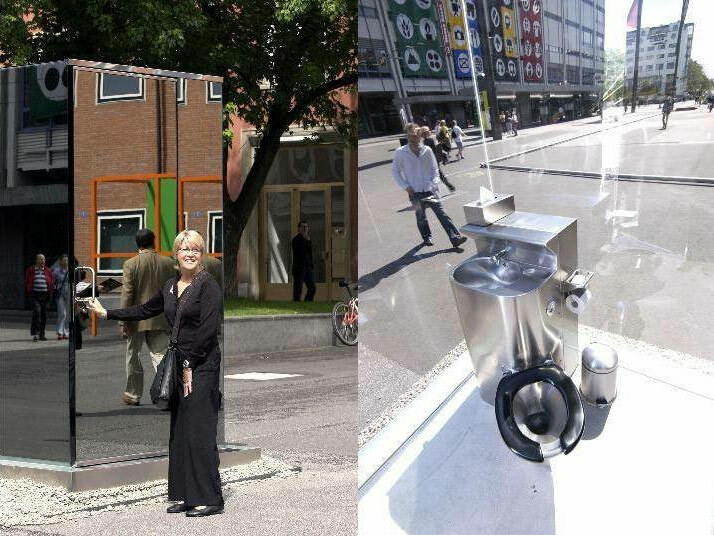 What technologies would these futuristic bathrooms incorporate? Here are some concepts that could give you some idea about what is in store. If you come across some ideas that you think need to be featured here, please mention them in the comments. Also we run a steady stream of cool posts like this at Home Designing and if you like to be notified when we have more such inspiring posts, please subscribe to our feed or newsletter! Let’s get started now, shall we! The first three are via Yanko Design, a terrific blog that features new concepts in design. Check them out if you haven’t already. There is a good chance that water might become a precious commodity in the future. Designer Jang Woo-seok keeps this mind while designing his concept bathroom which cleverly reuses the water drained from the sink for flushing the toilet. Here is another concept by designer Young Sang Eun that lays emphasis on hygiene. What is special about this design is that on one side it features a urinal and the other a sit-down commode. With the flip of a switch the design is capable of swiveling around. It self-sanitizes using Steam and UV. No more dirty toilet seats. Another one that focuses on hygiene. 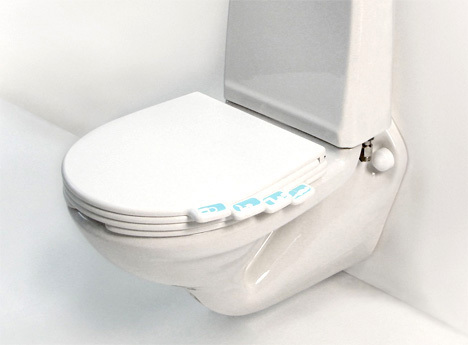 If you are using a toilet on a shared basis the toilet page concept by Jan Ctvrtnik would let you have your own ‘personal’ toilet seat. 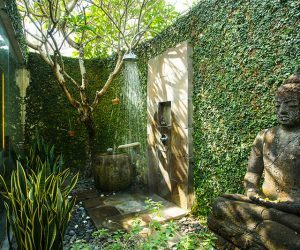 Check out this Phyto-Purification Bathroom by Jun Yasumoto. -The lemnas, which are also aquatic plants, bind to the remaining aquatic micro-organisms to complete the filtering process. -Finally, a carbon filter stops the remaining micro-particles. The water from the shower and the washbasin is filtered through an organic system before being re-used. Phyto-purification is a natural water-recycling process which is commonly used in ecological purification systems. The software giant Microsoft, occasionally tries to visualize and anticipate future lifestyles. The MSN network recently featured an article that highlights some cutting edge bathroom designs that are already available in the market. Here are some highlights from it. 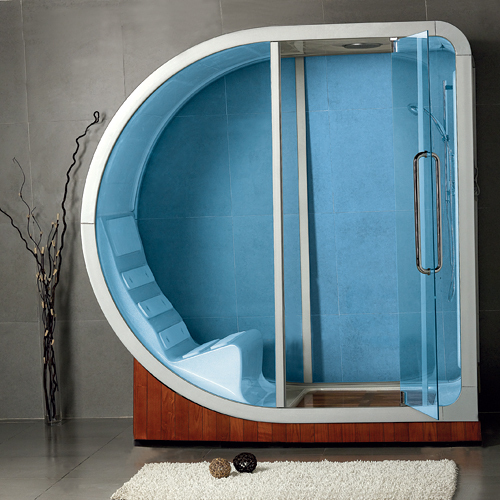 Linea Aqua’s Apollo steam shower lets you relax in the reclining chair as you take a shower and it’s blue-tinted safety glass with a unique overall shape gives you the feel of your very own space shuttle. 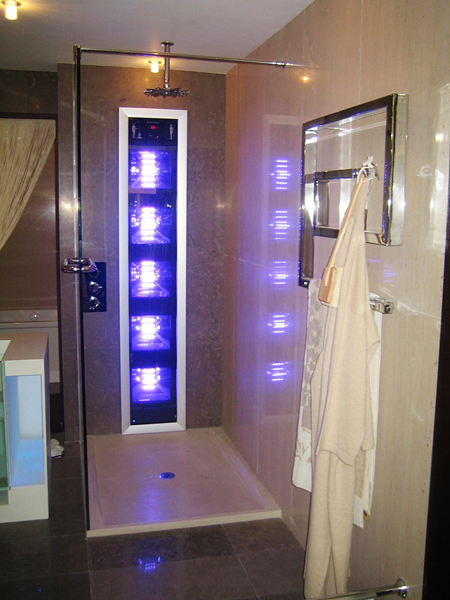 ProSun’s SunShower offers you more than a bathing experience. There are tanning unit of 400 watts attached along with a double UV filter so that you might achieve the perfect tan! 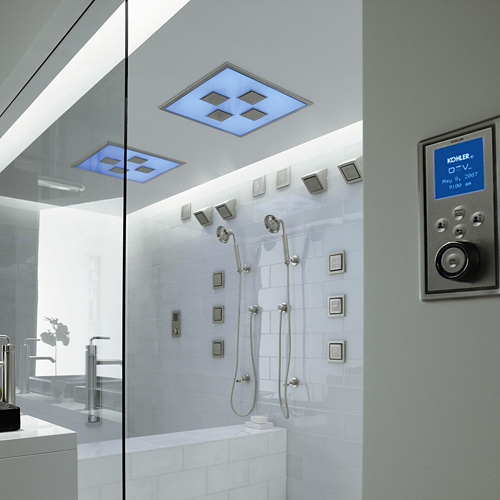 Kohler’s DT VII performance shower has a digital menu which lets you set up a mix shower experience for yourself. The six shower heads and two shower wands let you experiment a lot. It also has a mp3 player and you can control the light settings inside according to your mood. The Ondus bath systems by Grohe lend an organic-digital feel to the bathing experience as you can control the flow of water in the shower and sink which mimic the natural flow of water. 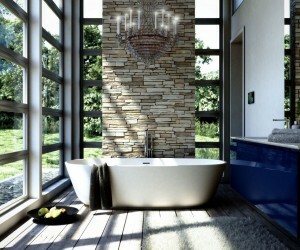 The Kohler VibrAcoustic Bathtub has it all! You get to soak in the cool tub which has a pre-set music designed to add sound and music vibration to sooth your tired south. 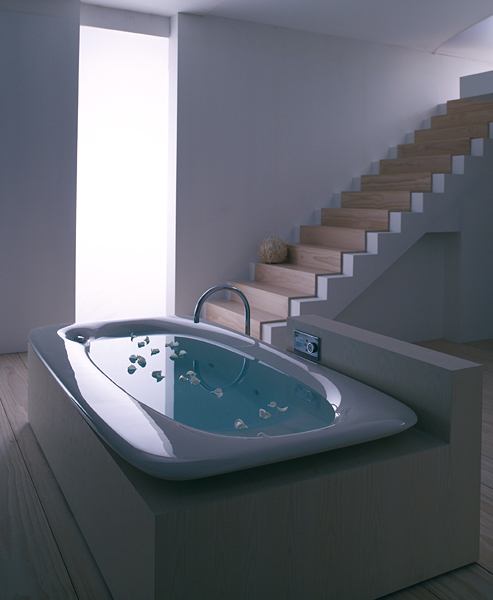 You can change the music pre-sets as well as the chroma therapy colours which light up the tub. Aquavision brings you an entertaining bathing experience. Now you can watch television while soaking in the tub on a 17 inch waterproof television. 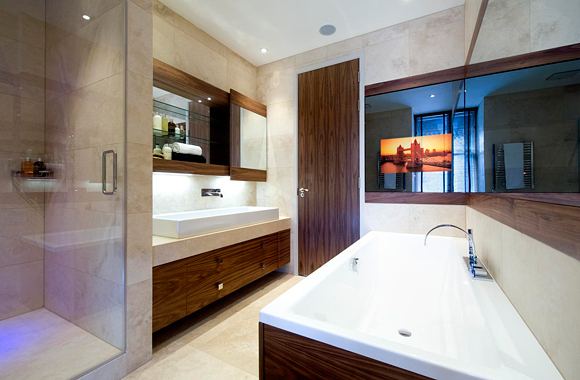 You may install the TV in various positions inside the bathroom and it will still remain dry. 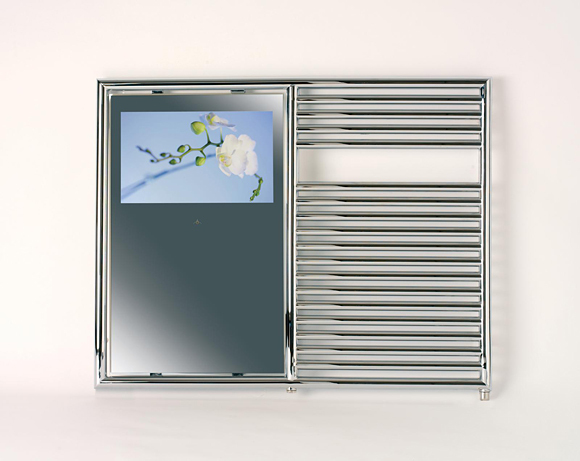 Aquavision bathroom designs gives you more than entertainment with a hot towel rail. Plus when you are not watching the television you can use it as a mirror. Talk about multi-utility! 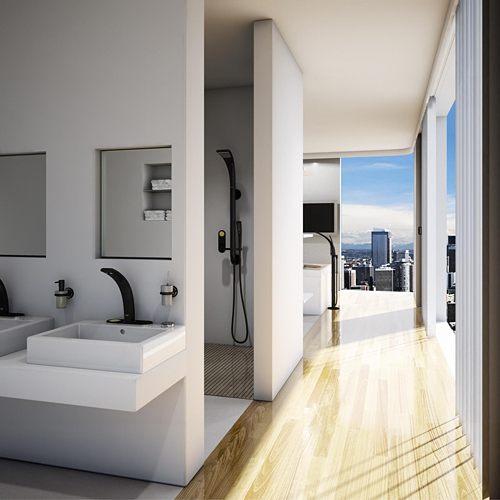 You can stay connected with the rest of the world through Visomatic’s waterproof media centre while you soak in your tub. You can access the television and the internet. The screen comes in a variety of sizes. To end with here is an interesting bathroom (not futuristic, but definitely interesting) that is made of see through glass in London. It is see through from the inside but viewed from outside it looks just like a mirror. If you enjoyed these futuristic concepts and would like to see more stuff from the future, check out our feature on kitchens of the future. You will love it!